No matter how advanced data centers may become, they remain in a perpetual state of change in order to meet the demands of virtualized environments. But with the advent of software-defined storage (SDS) architecture, capabilities associated with hyperconverged technologies (including compute, storage, and networking), help data centers meet virtualization requirements with less administrator intervention at webscale. This flexible, scale-out, and highly automated architecture provides enterprise-class data services for each workload, supplying the appropriate levels of capacity, performance, and protection while containing costs and bringing agility and efficiency to the data center by simplifying management, reducing reconfigurations, and improving TCO. 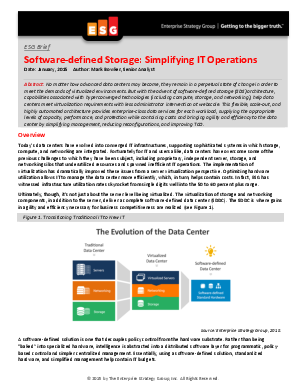 Read this whitepaper to learn how software-defined storage can simplify your organization's IT operations.